The 'Designer Malaria Vaccines' team at the exhibition. Image courtesy of Matt Higgins. The Royal Society Summer Science Exhibition is one of the UK's most prestigious science festivals, offering a packed programme of events and more than twenty exhibits of hands on science and technology. This year two groups from the Medical Sciences Division are represented at the Exhibition, exploring the topics of malaria vaccines and antibiotic resistance. 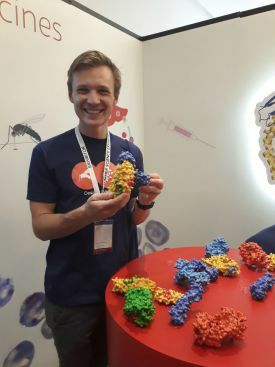 Scientists from the Department of Biochemistry and the Jenner Institute (Nuffield Department of Clinical Medicine) have collaborated on the 'Designer Malaria Vaccines' exhibit, which explores how structural biology is raising hopes for a vaccine against this killer parasite. Visitors to the exhibit will be able to explore this research through a number of different activities, including digital games and hands on models. An interactive map game will demonstrate the effect of different interventions on malaria prevalence on a mythical island, with players able to spend a budget on bed nets, vaccine or drugs, and maximise the effect of their vaccine to make it truly effective. Visitors can also play play a game in which they act as the immune system, attempting to detect the conserved elements on a variable parasite. Try out the games. 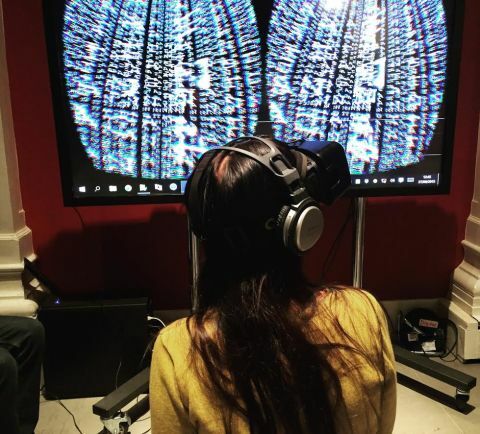 Sequence VR: Virtual Reality Microbes and Bacterial DNA. Image and technology courtesy of MMM, Anna Dumitriu and Alex May Arts. 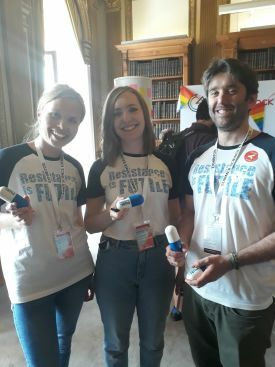 Researchers from the Modernising Medical Microbiology Group (Nuffield Department of Clinical Medicine) will also be exhibiting 'Resistance is Futile,' a stand about the rise of superbugs, at the Royal Society Summer Science Exhibition. This group is also using interactive games and innovative virtual reality to explore their research, which aims to use cutting-edge technologies like DNA sequencing, and large database analysis, to understand how and why these bacteria are evolving, how we can prevent this drug-resistance from spreading, and how to improve the treatment of patients with drug-resistant infections.